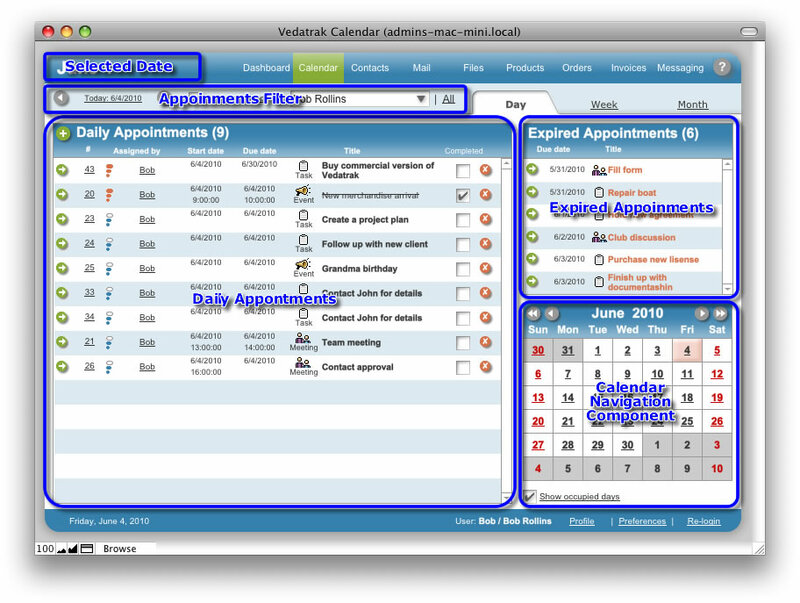 Calendar Day View, using the Appointments Filter, shows appointments for the Selected Date (today is the default), Expired Appointments and Calendar Navigation Component. Selected Date is displayed at the top of the page. You can change Selected Date using the Appointments Filter or the Calendar Navigation Component. Switch between days using the arrows or the Today button. Appointments for the current user are shown by default. To view other users' appointments, select the user from the Assigned to drop down list or click All to display appointments for all users. Daily Appointments are displayed only for the Selected Date. Users may add, edit, complete and delete appointments. Switch between months using Previous month and Next month . Switch between years using Previous year and Next year . 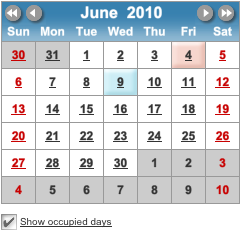 Check the Show occupied days check box to view dates containing appointments as underlined. Expired appointments are shown in red and displays appointments that were not completed on time (Finish/Due date < Today).